Holi a beautiful festival in India where enjoy each and every religious or every aged people. Without colour it is incomplete. Sometimes It's harmful for our face to another skin and eye. 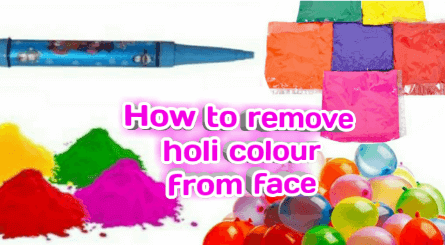 Today I am discussed how to remove holi colour from face or skin. Holi likes to play Holi with some dry colours, so likes to play Holi with water or natural colors. There are also some people who play Holi with chemicals and Rasayana colors. It is very difficult to get rid of these colors. This stylized colored skin causes great damage to the skin. They dry up the skin and many times even the red spots are also marked. These colors can also be easily redeemed by a few easy exclusive tips. Many people think that the color quickly removes with hot water but this is not true. With warm water many times the color becomes solid and therefore cold water should be used while bathing after the Holi. 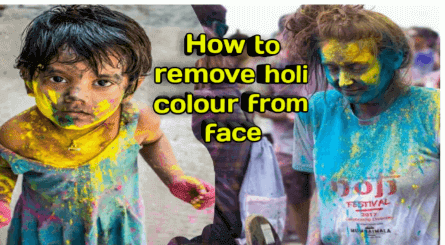 If you want your face skin to flame after Holi, then you should not let the color of the skin look too long, but keep removing the colors in between. It is usually less often that there is no color on the hair on the holi. But there is no tension in it, you should always keep drying the hair on your hair. After this, gradually remove the color from the hair with cotton or some soft cloth. Applying oil on the hair is extremely important before plays holi, otherwise, the hair does not move quickly. Before playing Holi, the body should properly apply cream or oil. Applying cold cream or coconut oil on the face does not last much longer in the face. Apply oil well on the hair with the face too. You should use the curd on the skin to remove the color. Massage the curd with light hands on the parts where the color is applied to your skin. Gradually your color will start to soften and keep in mind that during this time the skin does not rub very much. The citric acid present in lemon has the ability to cut the color or other chemicals. Many times applying lemon and honey on Holi after washing it, the color quickly gets rid of it. But on Holi, the color of low quality starts to burn on the face, so that honey and glycerin should be applied to avoid. If the color is very deep then you can also use gram flour and lemon. For this you have to make a lemon and gram flour, you can also add yogurt to it. Place the coating on the painted parts and remove the color with light hands. If there are many colors on the face or part of the body, then place paste made by mixing gram flour, curd and rose water at that place. After a while, when dried, it should be washed and rubbed there. 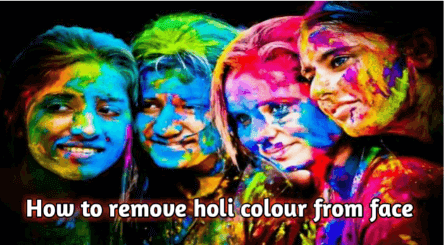 If there is more color on the face of the Holi, then you should apply polythene clay which will not only help to remove the color but also make your face beautiful. wash the hair with shampoo while reducing the color, then mix the vinegar in the water of the gooseberry and then wash the hair. Your hair will be as bright as before. If the color is not lightened by your skin and burning is also occurring, do not use soap etc., but clean the skin properly with the dough and then wash it with water and add moisturizer to the skin. This will make your skin soft and there will be no irritation. Do not use sharp objects to redeem Holi colors. If any type of color is allergic, then consult with the doctor as early as possible. Leave the egg on the hair for 30 minutes and then wash it with a light shampoo. The hair is strong and silky. Lemon juice and baking soda can also be used to get rid of hair color.